For the most part, we garden with wood chips, but last year we couldn’t afford to have any delivered or to go pick them up, so we used the hay and straw that were in the barn to cover our garden beds. This year, we put it in the budget, because as it turns out, I’m pretty allergic to hay. If I come in contact with it and don’t shower, I end up having sever coughing fits and breathing problems when I try to sleep at night, though the worst of it during waking hours is itchy eyes, some sneezing and maybe a little bit of coughing. But I didn’t figure that out until sometime after we put hay all over our garden. Plus, we don’t have nearly enough hay to mulch all of the garden, and we use that for bedding in the chicken coop. We don’t want to always have to buy wood chips. Ideally, you find a free resource and use that for mulch. There’s a tree-trimming company that comes through here to maintain around power lines and roads, and they chip all of those branches and offer them for free to anyone who asks (first come, first serve). The best thing would be to start accumulating new wood chips (for free), allow them to age, and then put them into the gardens in a couple of years. So when those men drove up outside of our house to cut down branches from the trees by the neighbor, I ran out to see if I could maybe get some of those wood chips! Well, they said they would, but they didn’t say when, and since it’s first come, first serve, I really wasn’t sure I’d get any. But they dropped a load off the other day. This load will be used for mulching in the Secret Garden and in the flower beds around the house, but I’m hoping that they drop off a lot more… because I asked for wood chips a second time when a man from the town’s road maintenance department came over to talk to me about cutting down some of our willow trees that are too close to the road. And then I asked again when I called the company to tell them that we want as many as they can give us (if they have any that aren’t claimed). And then I asked again, because the lady on the phone told me that a faster way to let them know that we want a lot would be to call the utilities company and have them put us on the list with a note saying we want as much as we can get, and I took her advice and called to be put on that list. Worst case scenario, we don’t get any more free wood chips this year. Best case, they end up bringing LOTS of loads of wood chips! Free wood chips! These are really new, not broken down at all. It smells heavily of pine. Yeah, I don’t know if you caught that, but somebody from the town road maintenance department came over and cut down 10 “small” willows along the road on our property. We had a feeling this might happen. Thankfully, we had an idea that they might need to go, and thankfully we weren’t the ones who planted the trees in the first place. But sadly, those trees create a bit of a privacy screen leading up to our house. I asked him how far back new trees would have to be planted if we were to plant more along the road, and he told me about 10 ft. or more behind the row that was coming down. He took down all of the willows to the north of the house but the largest, and told me that the guys with the wood chipper would be coming through the next day to clean up. 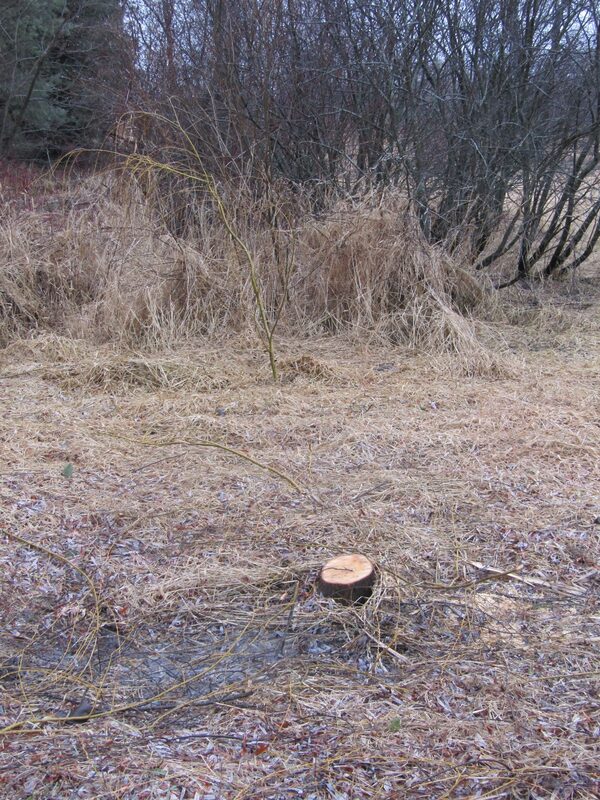 The carnage (or what is left of the carnage) of our willow trees after they were removed. “They” say that willows grow like weeds. Which they do…but that’s not always a problem. 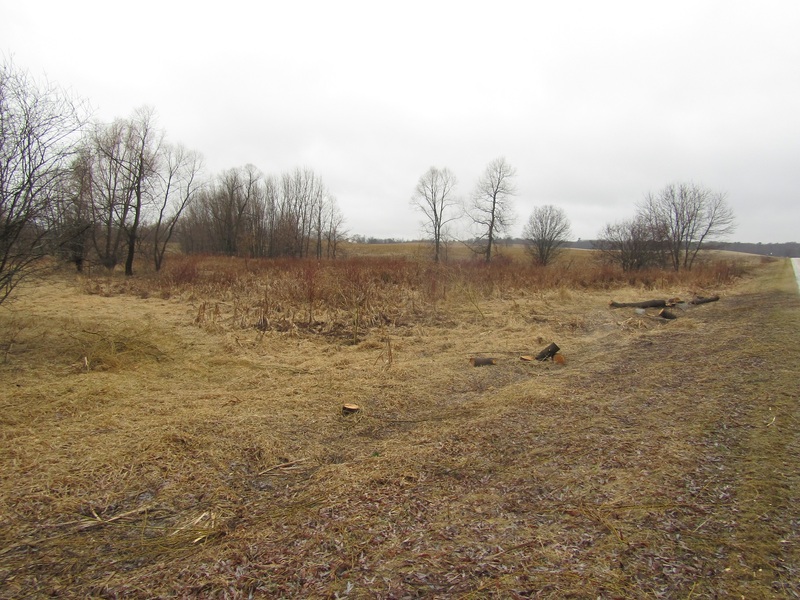 In fact, we had been planning to plant a long row of willows along the pond side of the path that runs through our land, and I was going to take cuttings in the next few weeks and plant them. My timeline got sped up when the guy cut down the trees, because part of the work was done for me. We’d want to get those branches in the ground in the next 24 hours if possible, but I figured Scott or I could go out that evening and gather enough branches for our project. And then I heard the chipper truck coming…same day, not the next, and I worried they’d take all of my branches away, so I ran outside like a mad lady and started throwing branches into a pile. A stump of a tree that has been removed. A branch is “planted” in the background. That was on Tuesday. Yesterday, the kids and I planted most of the branches along the ponds, and then Scott helped finish up after he got home from work. 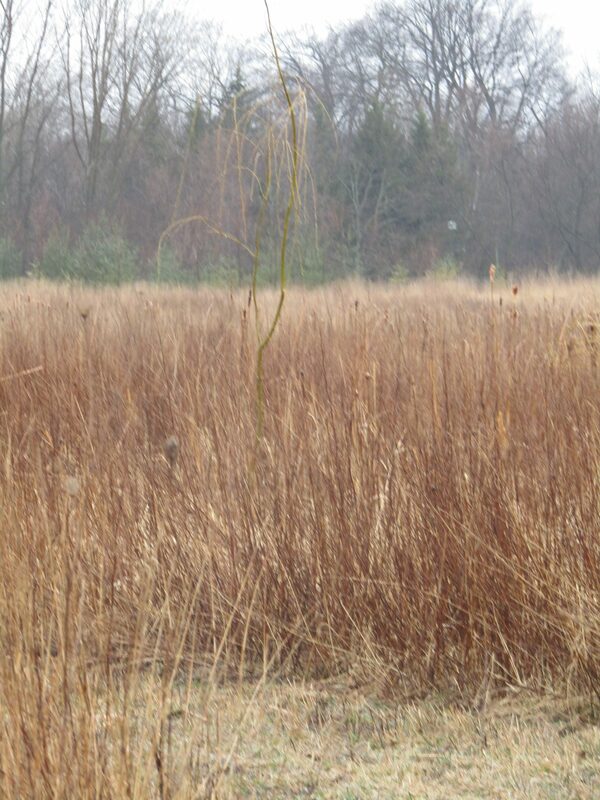 If you think I’m crazy for just planting a branch in the ground and expecting it to grow, well, not willows. Willows produce a tone of natural rooting hormone. You can soak them in water to get them to root, or if you are going to be planting them in wet soil, you can stick them straight into the ground. The ground is always damp everywhere we planted branches, which is perfect for willows, so they shouldn’t have a problem taking root. A “new” willow tree near the big pond. Some people see willows (especially the weeping ones) as a nuisance or a weed because they grow so quickly and readily, or because of the fact that since they grow quickly, they have a shorter life span (30-50 yrs.) I’m fine with a tree lasting 30 years, especially when they can be “replaced” so easily. Plus, I’m partial to weeping willows. We had a few near our house while I was growing up. Then there was one at the duplex we lived in when we were first married, and to be honest, I grew up watching Disney’s Pocahontas, and who didn’t love Grandmother Willow??? Getting back to wood chips though, as I said before, we ordered some this year. In fact, I ordered them Wednesday morning, and they called me to say that they’d be ready to deliver yesterday! Delivery doesn’t usually happen so early in the year, but I guess the weather is right! I remember waiting until May one year, and we were 2nd on the list. This year we were third, and they’ll be delivered them in March! Load #1 of wood chips, delivered right in front of the garden bed. These wood chips were ordered through the county’s recycling center. 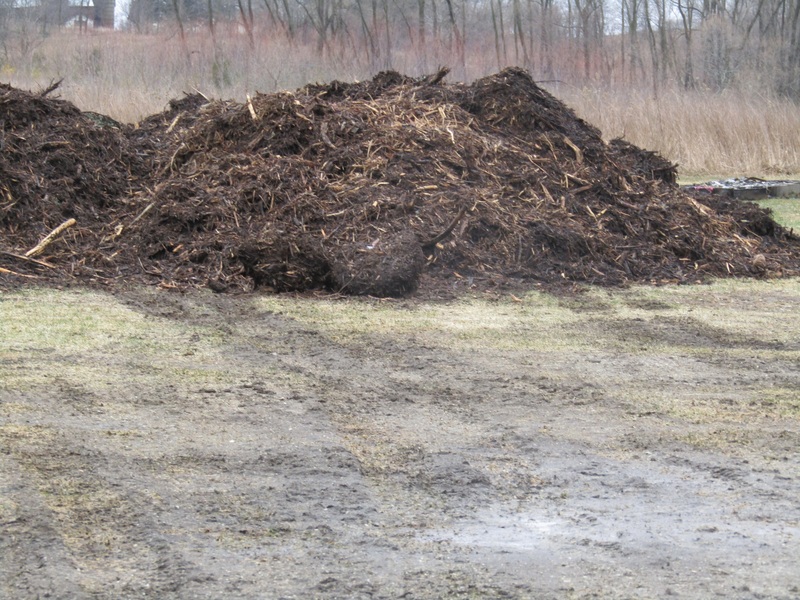 If you call your local recycle center (either city or county), they often have mulch and compost that will either be free for pick up or available for a small fee, and some places will even deliver. We paid for delivery, but there would be no way that we could come even close to purchasing this quantity of wood chips for our garden in bags from the store for what it cost to have one load delivered. And since we don’t have a stock pile of free wood chips, decomposing on the property, this is actually a really frugal way to go. 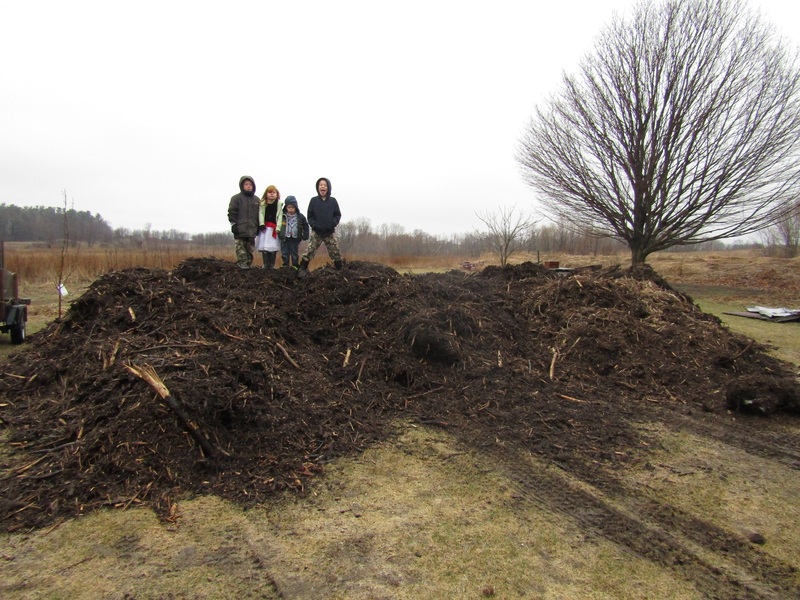 There are some small tree trunks, and a lot of decent branches in the mix, but a lot of this is really well composted, and we can pull out the really big stuff without loosing much in the way of volume. Heads up, 6 loads of wood chips isn’t exactly cheap, BUT if you ordered one load or filled up a trailer to bring home, it is definitely reasonable for most folks. The kids standing on top of 6 loads of wood chips. Wood chip mulch is a time saver for gardening, and can help any “brown thumb” see that gardening doesn’t have to be so hard. While there are immediate results from using wood chips, there are results which make the effort and money spent on them that make them so much more worth it in the long term. For us, this is all about the big picture. We want to do organic gardening with less weeding and no tilling, and this will get us there with time. Part of the wood chip mound, dumped in front of the garden. This picture doesn’t quite do justice to the amount of mulch we now have, but this was 6 loads of wood chips at 6 yards a load. I’m pretty excited to have all of these, but the sad thing is, it’s probably not enough to cover the whole area we are going to be gardening this year…we are going to triple the size of the main garden, and this will probably be enough to cover 1/2-2/3’s of the garden. Are you wondering why we use all of these wood chips in our garden bed? I thought I wrote a post just about this, but I can’t seem to find it, so I recommend you watch this documentary to find out about mulching and natural gardening… this is what got us into gardening in the first place! What do you do in your garden? Do you mulch or not? If you mulch, what do you use, and where do you get it from? Don’t forget to leave your comments below! Those willows will grow faster than you can ever imagine! When Dad planted all of those branches around the pond, they took off so fast, it was really fun to watch! Good to know you got so many wood chips. Will you have to re-do all of it every year? Yes I’m glad they grow so quickly, because it is sad to have them be cut down. At some point, no, we won’t need to apply wood chips every year, or at least not such a thick layer. It helps build better topsoil, which makes plant growth (and weeding) significantly easier. 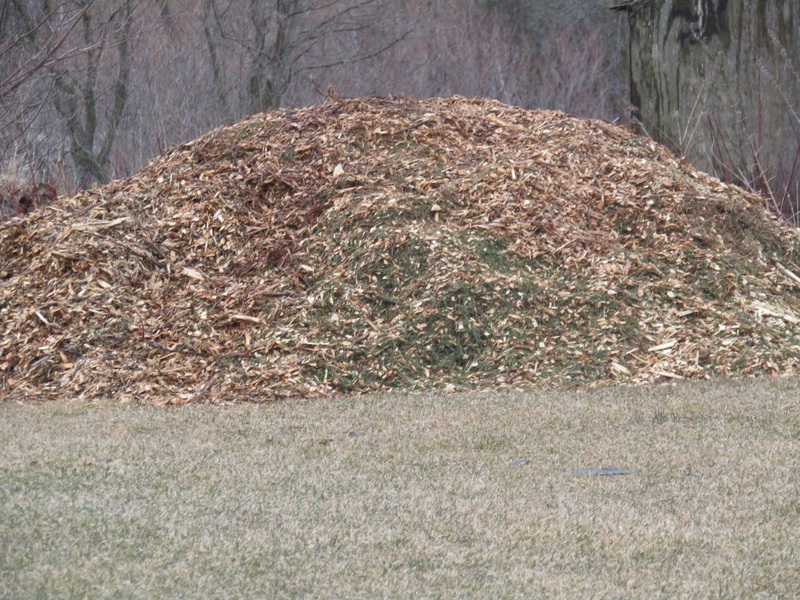 Ideally, we get free wood chips that we can allow to decompose on a pile somewhere in the yard for a couple of years, have a few piles and then add them to the garden each year as they are ready. Fresh wood chips take more energy to decompose and can strain plant growth, but in my experience, it’s still better for the plants than no mulch. That’s why the fresh ones will work better in our flower gardens for now. The flowers will still grow, but I am not as worried about strain on them as I am on our food producers. D > Well, Danielle, I’ve just been blogging about dearth and plenty, and looks like you’ve experienced both in just a couple of days! Whatever we add to the garden soil, it’s better composted first. There are exceptions. In our garden, we mulch over the dormant rhubarb crowns in winter with seaweed direct from the beach (a full barrow per crown). By the time the crowns are breaking ground in mid spring, the seaweed has lost its salt and is largely rotted down anyway – creating amazing soil structure. Likewise winter mulch over Jerusalem artichokes,, around winter-dormant fruit bushes and trees. The mulch is less about suppressing weeds as protecting the roots/crowns/tubers from wind-chill and slow-release fertilizing. For ground improvement before planting out new fruit bushes or other perennials, we dig in deep a barrow of 2-yr old compost per bush. For other seasonal produce (roots, brassicas, potatoes), in late winter we barrow out from the ‘mature’ compost heap 1 barrow of compost for every 4ft x 4ft, working it into the soil before sowing seed or planting out. 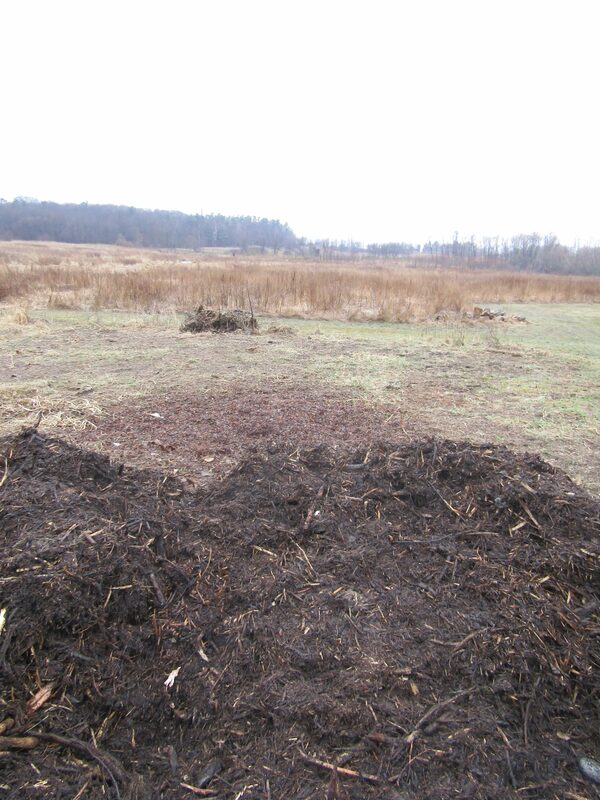 Compost is made with kitchen waste, garden waste, seaweed, animal bedding. Accumulate over 12m in Bin 1 (8 pallets forming a square). Turn over into Bin 2 in late winter, when Bin 2 is emptied into the garden. Compost is therefore 12m-24m average 18m old when used. Variety is the spice of life – and of a healthy garden! I love how lazy I can be once the mulch is applied. Far less watering, and it does amazing things for the plants. We wanted to order our mulch in fall, but were unable to, so I am glad these chips are as decomposed as they are. That is wonderful that you are able to use so many things to compost with right from your own home. Scott is looking into doing some bio-char this year (adding wood ash to the soil) in a few places around our land this year, so that will be interesting to see how that turns out. What is your favorite garden crop to grow? J > Difficult to pick a favourite. But for reliability, usefulness, quality, ease of growing – peas. They even make their own fertilizer (or at least the nitrogen), so they follow potatos in the 4-yr cycle. We add lots of compost for potato, but minimal for the peas. We buy ours from a local gravel place. It’s relatively ch3ap, but I am going to call my city recycling center. We live 3 houses from the city line so we are city residents. Maybe they have it cheaper. Definitely worth looking into. Each city or town or village will handle it differently. The worst they could say is no.